I wore my gold glitter loafers to death last year so when I found a navy version, I knew they had to be fabulous! For $39 at Gap you can snag these or if you are wanting to splurge, try this pair from J.Crew. If you're hesitant on how to style glitter loafers, take a look at this ensemble. But whichever shoe you choose, I think it's pretty obvious you will wear them for months to come! Navy glitter: are you a fan? 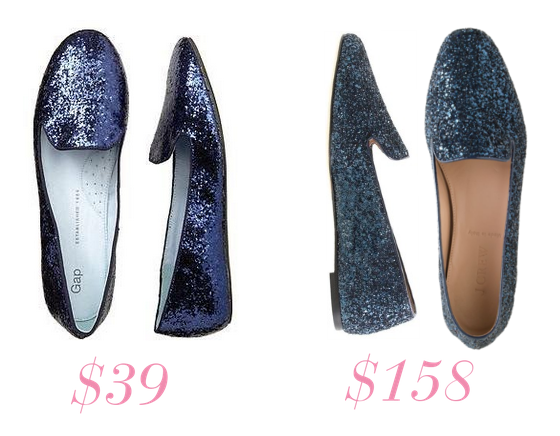 Adore any shade of glitter and pretty much live in blue so these just made my wishlist. Thank you for the post! I love when people show looks for less, it shows you can have great finds at any price. I love those Gap shoes, they fit right in my budget! Looove these! I have a pair of gold glitter loafers from a couple seasons ago, and they add such a fun touch to any outfit! I love these glitter loafers! I have some glitter ballet flats but these loafers are amazing! I actually like the Gap loafers better than the J.Crew ones!